If you are familiar with bodybuilding and bodybuilding exercises, then you’ve probably heard or come across the words suicide grip or in other terms false grip or thumbless grip. The suicide grip as I prefer to call it is a technique used by muscle builders in grabbing barbells and dumbbells. This gripping technique basically involves holding the barbell bar with your fingers excluding the thumbs. For this reason, it is one exercise technique that is highly discouraged unless you are a professional with prior experience and confidence of safely performing the technique. 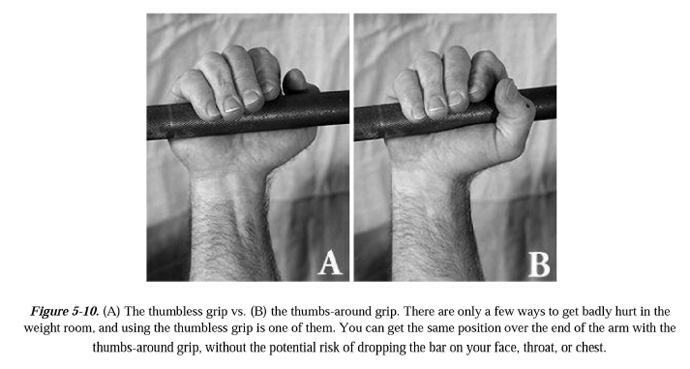 The thumbless grip is said to provide better bar placement, especially when doing a bench press even though a slight mistake in movement or balance could become fatal. When you squeeze the bar using the four fingers and exclude the thumb, you are believed to work out all muscles groups efficiently and individually, therefore greater results in building muscles. Lie down on your back on a bench that should be placed under the barbell. Fine-tune your body so that your eyes are placed directly over the center of the bar. Ensure that your eyes are focused above the bar and your chin stays intact. grab the barbell with both hands (there should be a significant distance between your hands and body). Clutch the barbell in your hands and wrap your fingers around the barbell. This is where the suicide grip comes in; after you have the bar in your hands, wrap four figures of each hand around it while letting the thumbs be in normal position and not wrapping the barbell. Squeeze the bar tight. you need to press back against the bench with your chest all out. Here you will feel that every part of your body feels so tight. You will then part your feet a few inches and place them flat on the ground. You are now in position for the bench press, the only thing remaining is to lift off the barbell from t﻿﻿he rack and start pressing. If you find the load too heavy, then your gym assistant can help you unrack it and when you have it comfortably lifted up and ready to go he can let it go. To do the bench press, you just lower the bar slowly at least until it is slightly above your chest, pause and then get it back up. Repeat the process to complete Reps.
As you do this exercise remember to keep all the engaging body parts in the correct position; for example, your chest should puff out and your feet flat on the ground with heels trying to dig into the floor. If you can manage to pull the above instructions and do the bench press with a suicide grip then thumbs up, otherwise, if you make a slight mistake with the barbell lifted above you, it could easily roll over and land on your chest. Can you image what will happen next? You will either find yourself in the hospital with broken ribs that is if you are lucky or worse off in the mortuary if you end up unlucky. I honestly don’t mean to scare you, but that is the real situation on the ground. 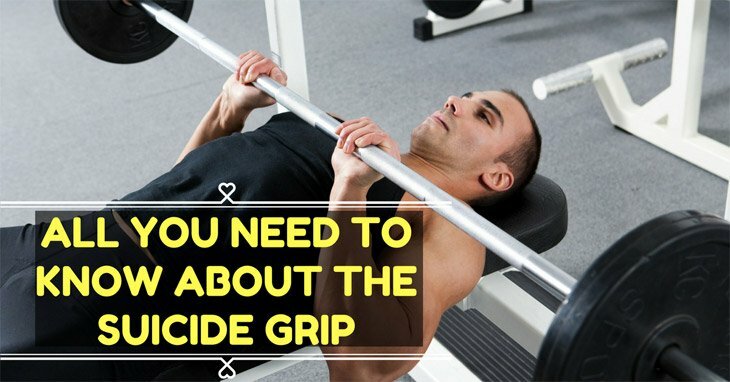 To summarize, the suicide grip can be of good use to people with the need to take their bodybuilding to the next level. If you are confident enough and have managed to pull off such riskier exercises, then go ahead and try it. But if you are not sure of your ability to complete a successful rep then just keep using the hook grip. Additionally, if you must use this technique in your muscle building exercises, then consider using a power rack with safety pins to avoid landing the load on your beautiful, fragile body. All said, what are you going to do? To try or not to? I will leave that up to you.